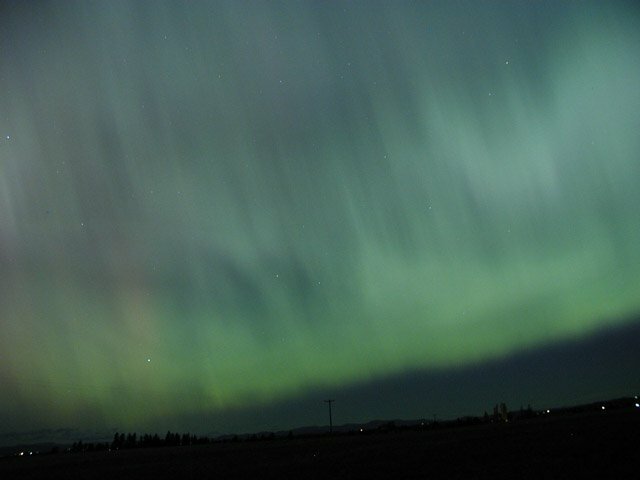 Summary: It's northern autumn and that means it's aurora season. 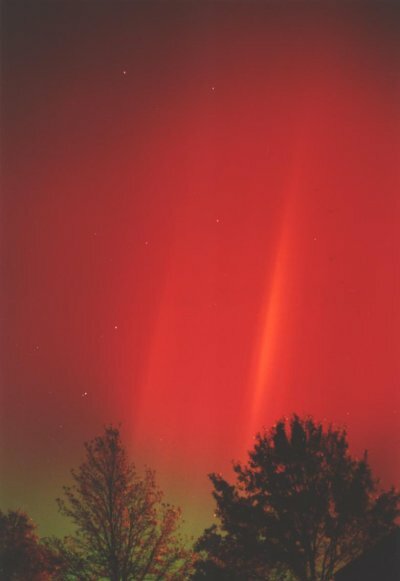 The auroras on this page were triggered by a coronal mass ejection hitting Earth on Oct. 29th. The CME was hurled into space by one of the most powerful solar explosions in years--an X17-class flare from giant sunspot 486. 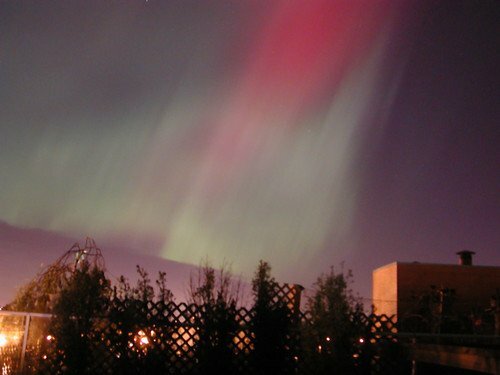 See also the September 2003 aurora gallery. C. Ponder: "What a wonderful show! 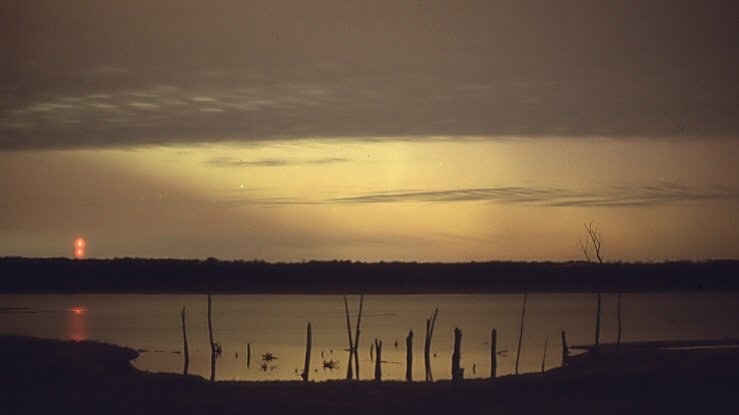 Vivid spikes shot up about 15 to 20 degrees above the horizon." 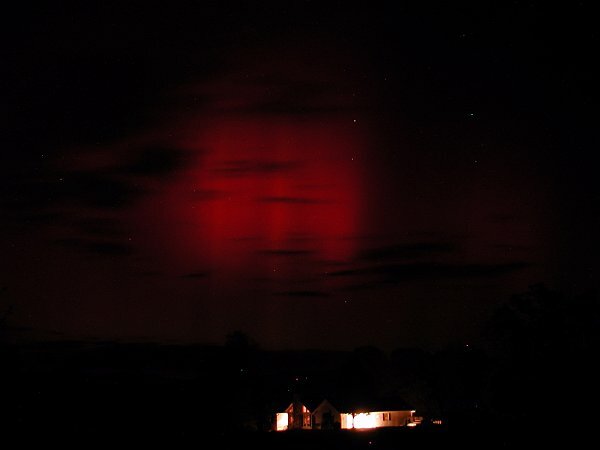 S. Richard: "We were mostly clouded out but we drove and found a hole in the clouds and were rewarded. 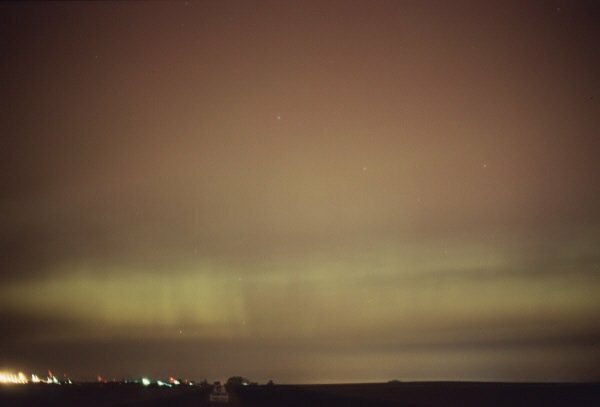 28mm lens @ f/2.5, exposed for 15 seconds on Fuji Provia 400F(pushed 1 stop)." A. Cason: "I was too excited to remember to look at my watch during the show. I think it started about 3:15am eastern time. It was very subtle at first, and low in the NW. As it moved eastward it increased in intensity. 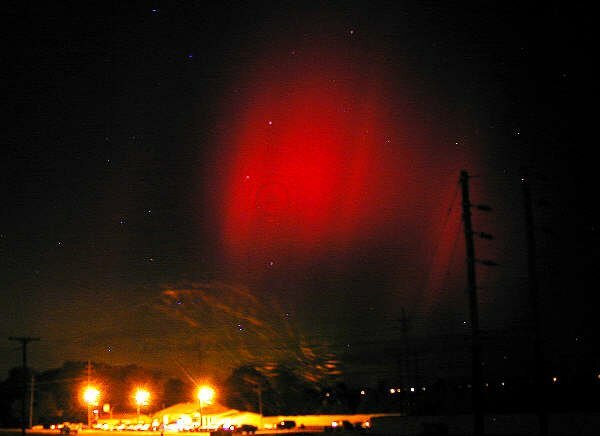 Red and white rays were easily visible as it reached due north. 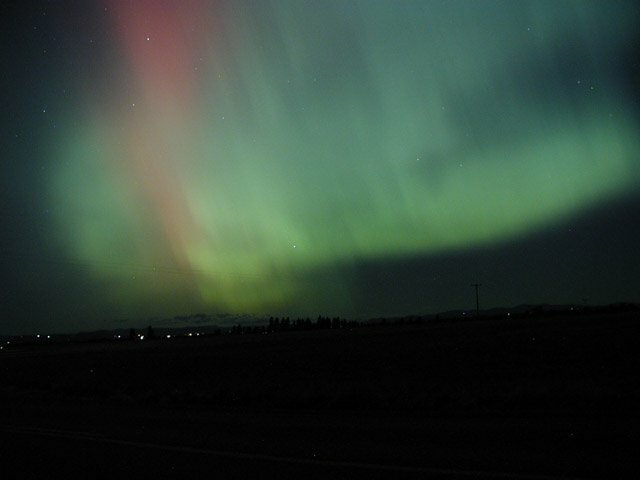 As it moved toward the handle of the big dipper it lost some intensity and faded. The entire show was 45 minutes to an hour, I think. 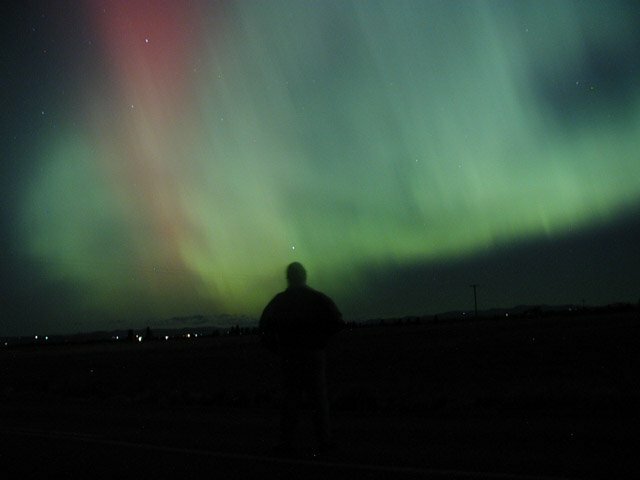 I used an Olympus C-2100 at f 2.8 and a 16 second exposure. " M. Brown: "Excellent display. 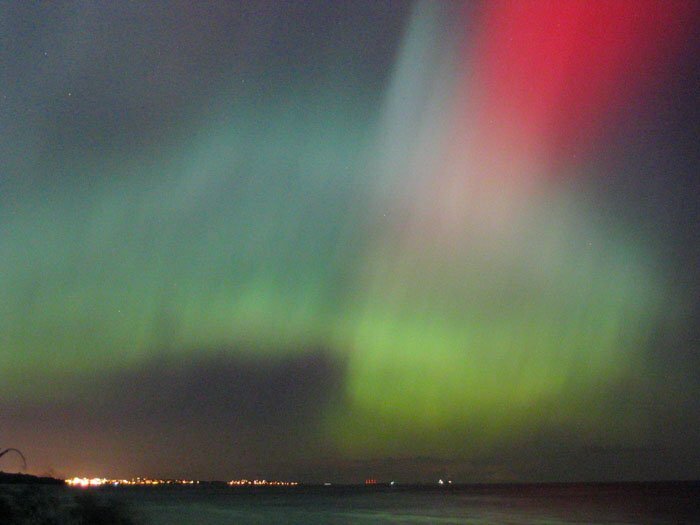 Brilliant reds, greens and yellows were splashed across our northern sky sometimes reaching near the zenith." 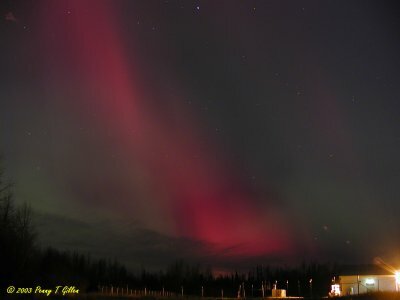 D. Storey: "I went up to my rooftop patio at around midnight (after checking out your site), and saw some really spectacular strands from the aurora. 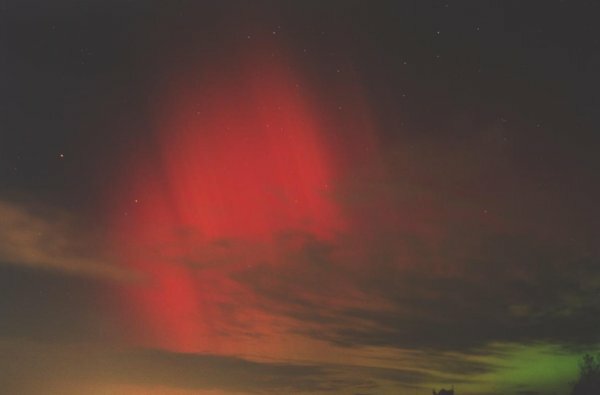 I live in Vancouver, BC, and have only seen the aurora here once or twice in my whole life.. "
R. LaBar: "My sister Caitlin and I saw the aurora for the first time this morning from about 12-1 (the brightest around 12:30). The green and red was just gorgeous." G. Mayfield: "We had a very nice display here in Colorado this morning." 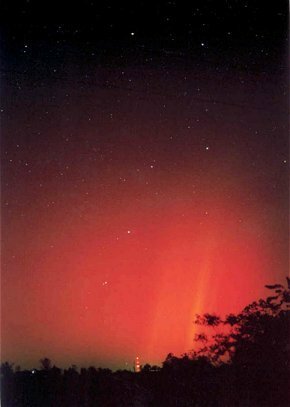 G. Thomas: "Even here in the depths of the Bootheel of Southeast Missouri we got a little show. 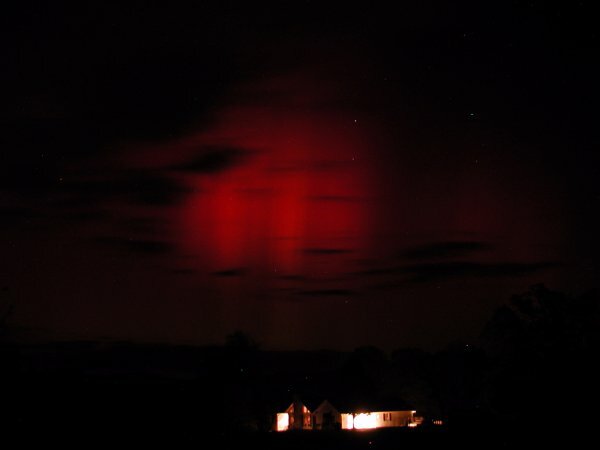 I woke the family up at 3:10 am (central) and then managed to take this photo with a Nikon Coolpix 950 at F2.8 and an 8 second exposure." 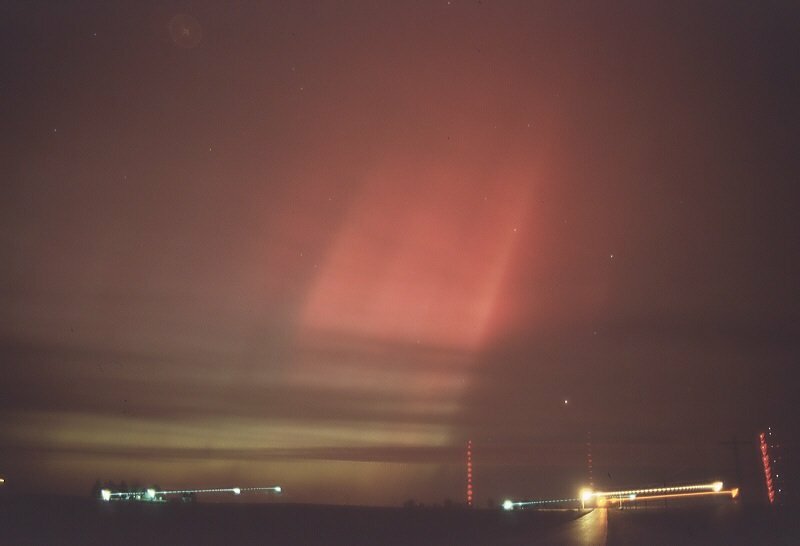 B. Nam: "The display started out around local midnight as a diffuse but bright glowing band. 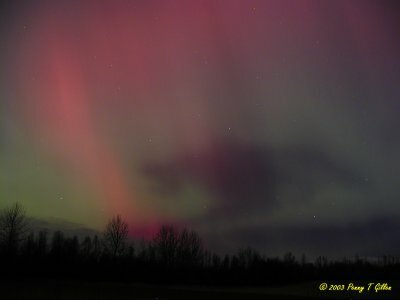 Then everything intensified and exploded into a very impressive show of mostly green curtains and rays along with some red for about 30 minutes. 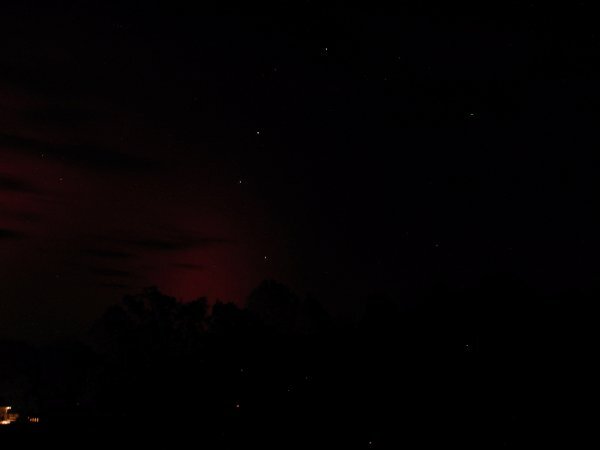 It almost filled the entire northern sky." Photo details: Olympus Digital C-3000Z at F2.8 with 10 - 13 second exposures. 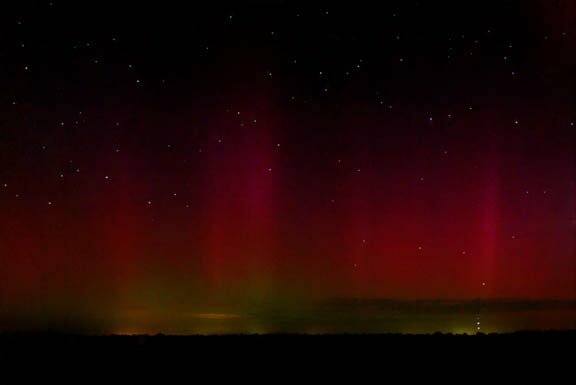 S. Buttnor: "What a great display here! 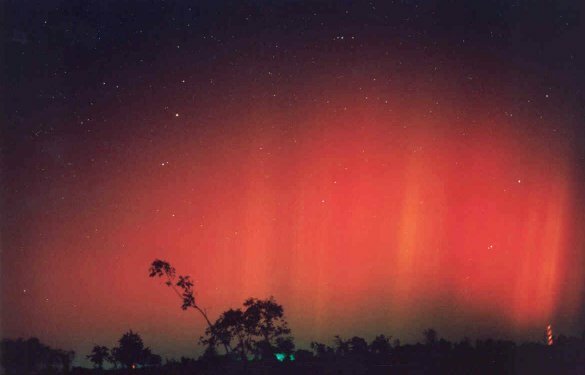 For six hours we had auroral activity somewhere in the sky, and often almost everywhere. 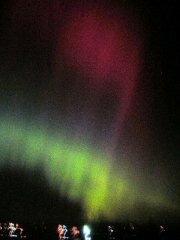 Virtually every kind of auroral structure was seen, and the colors were lovely. Photos: . Camera: Canon Powershot A70." 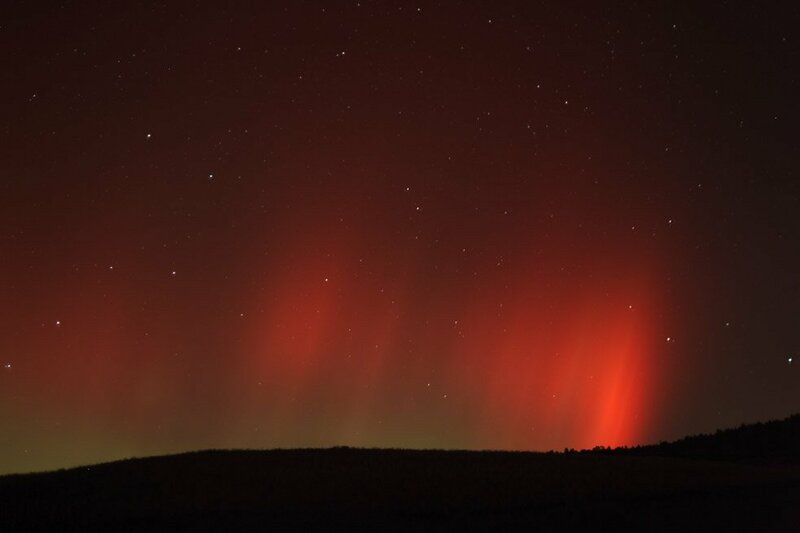 P. Gillen: "The auroras tonight were a bit eerie. 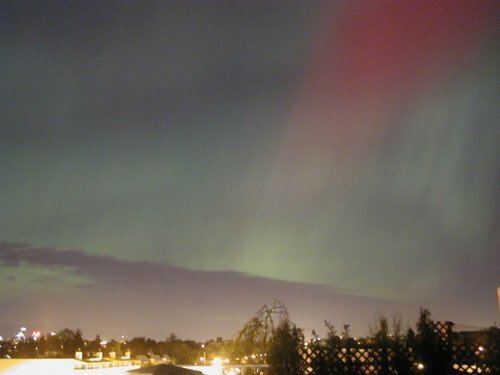 Some strange looking shadows showed up in the sky and for a good portion of the show - it was just like a huge green glow across most of the sky. They danced for a while, but after that it was one big green blanket with a good bit of red weaved in."